i rather new to mean stack and i'm trying to pull some components using bower. I have my .bowerrc file which gives the path for installation. I tried to change the encoding of file and used json online validation tool. Another solution is to open the file in Notepad++, go to "Encoding" and select convert to ANSI. Change the Encoding type to "Western European (Windows) - Codepage 1252" and leave the Line endings to "Current Settings"
I had this issue due to Visual Studio adding a BOM to the start of the file. Opening it in Notepad++, going to Encoding and selecting "Encode in UTF-8 without BOM" solved the problem - the advantage of this approach over converting the file to ANSI is that you can still use Unicode characters in the Bower.json file. Obviously you can also do this in any other text editor that supports the stripping of BOM's from a file encoded in UTF-8. It may be because of a single line comment inside bower file. Comments of the form //… or /*…*/ are not allowed in JSON. So you'll get this error if you really have // bower.json line in the beginning of your bower file (like in the provided example). Finally with a little help i got it!! Now I'm going to write the solution for others. 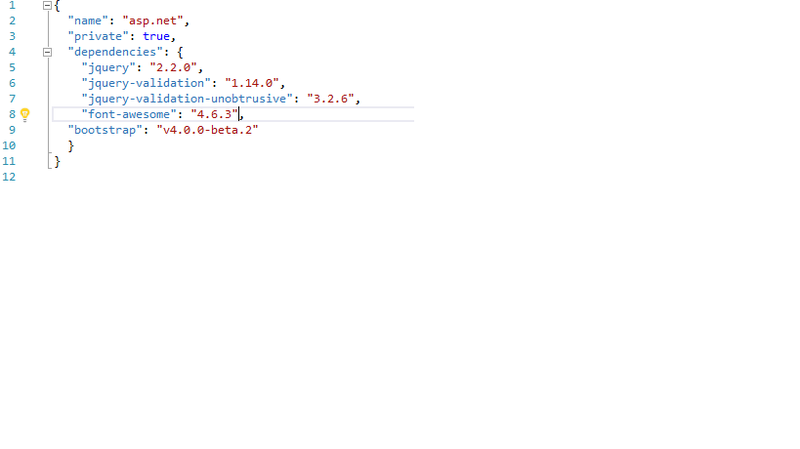 I copied the content of bower.json from the web to sublime3 text editor. The editor added characters i can not see. copy paste to the old classic notepad and replacing the file solved it for me. I also had this really annoying issue. What worked for me was that I simply opened the bower.json file in Visual Studio 2017, saved the file again using Ctrl + S and that's it! I could now, for the first time, install packages via Bower! What worked for me was actually uninstalling the package i.e. in this case Bootstrap and then just including the version of Bootstrap that I wanted to use in my project in Visual Studio. See below for screenshot. I then saved and bower did its magic!!! Not the answer you're looking for? Browse other questions tagged node.js angularjs bower mean-stack bower-install or ask your own question.